Nearly 6.8 million Hispanics voted in the 2014 congressional election, a record total. But the voter turnout rate among Hispanics fell to 27%, the lowest rate ever recorded for Hispanics in a midterm election. Voter turnout in 2014 was down among all Americans compared with 2010. According to estimates based on Census Bureau data, 92.3 million Americans voted in 2014, down from 96 million in 2010. As a result, the national voter turnout rate fell from 45.5% in 2010 to 41.9% in 2014 (File, 2015). Voter turnout rates also fell for all large racial and ethnic groups. For whites, turnout decreased from 48.6% in 2010 to 45.8% in 2014, a decline of 2.9 percentage points. Asians also had a decline in turnout (4.1 percentage points), from 31% in 2010 to 26.9%. The turnout rate among black voters dropped from 44% in 2010 to 40.6% in 2014, a decline of 3.4 percentage points. This stands in contrast to the 2012 presidential election, when the turnout rate of black voters topped that of whites for the first time (Taylor and Lopez, 2013). Nonetheless, both white and black voters had higher turnout rates than Hispanic or Asian voters in 2014, continuing a long-term gap in voter participation rates. Even though the number of Latino voters in 2014 set a record, the rate of the increase was substantially smaller than between previous midterm election cycles. From 2010 to 2014, the number of Latino voters increased from 6.6 million to 6.8 million, a growth rate of 1.9%. By contrast, the number of Latino voters grew by 18.8%, or 1 million voters, between 2006 and 2010. 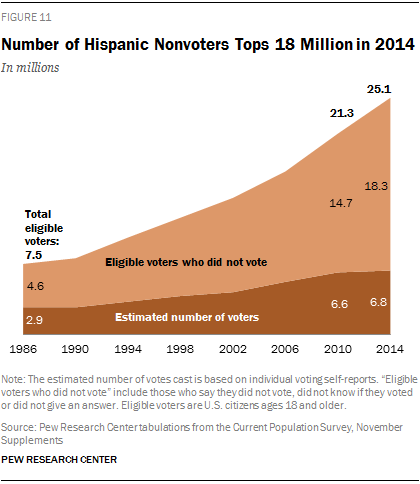 While a record number of Hispanics voted in 2014, another new high was reached. In 2014, the 18 million Hispanic eligible voters who did not cast a ballot—i.e., nonvoters—outnumbered those who did by nearly three-to-one. The Hispanic electorate’s participation in midterm elections continues to be below what might be expected given the rapid growth of the group’s overall population and number of eligible voters. In 2014, the number of eligible Hispanic voters reached 25 million, up from 21 million in 2010. Much of this growth is due to the coming of age of 3.8 million U.S.-citizen Hispanics between 2010 and 2014. But it is this very group of young people, millennial Hispanic eligible voters, that has the lowest voter turnout rates among major Hispanic demographic subgroups—15.2% in 2014, down from 17.6% in 2010. Millennial Hispanics are not alone. 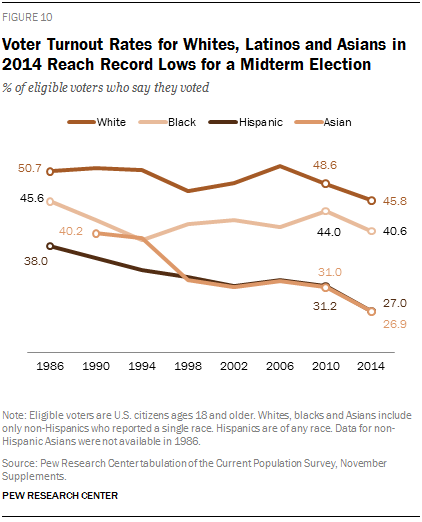 Voter turnout rates declined among nearly every major Latino demographic subgroup. In 2014, the highest voter turnout rate among Latinos was among those in the Silent and Greatest generations (46.7%), followed by college graduates (42.1%) and those in the Baby Boomer generation (40.1%). But compared with 2010, voter turnout rates were statistically unchanged for Silent generation and Baby Boomer generation Latinos and down 8.1 percentage points for Latino college graduates. At the other end of the spectrum, among Hispanic eligible voters, the lowest turnout rates were among Millennials (15.2%), those with less than a high school education (20.5%) and high school graduates (22.1%). High school graduates and Millennials saw statistically significant declines relative to 2010, dropping 3.7 and 2.4 percentage points, respectively. While Hispanic voter growth in 2014 was up just slightly relative to 2010, the number of registered Hispanic voters grew at a faster pace. In 2014, the number of Hispanic registered voters reached 12.9 million—a record for a midterm,[ 7. The estimated number of Hispanic registered voters is based on self-reports from the November Voter Supplement of the 2014 Current Population Survey.] up 1.9 million, or 17.1%, between 2010 and 2014. Among registered Latino voters, the voter turnout rate was sharply lower in 2014 compared with 2010—52.7% versus 60.5%. 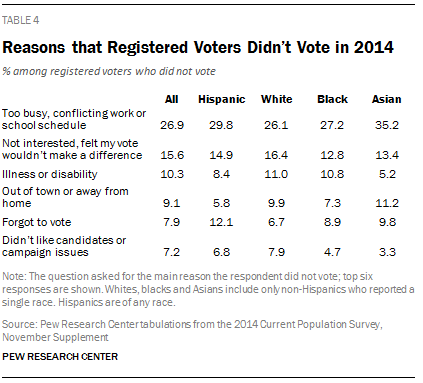 “Too busy, conflicting work or school schedule” was the top reason given for not voting among all racial and ethnic groups, with 35.2% of Asians, 29.8% of Hispanics, 27.2% of blacks and 26.1% of whites citing it. The second-most common reason given across all groups was “not interested, felt my vote wouldn’t make a difference,” with 16.4% of white nonvoting registered voters, 14.9% of those who are Hispanic, 13.4% Asian and 12.8% black giving that reason. One other reason offered for not voting was “forgot to vote.” Overall, 7.9% of all registered voters who did not vote cited this as the reason. But among Latinos, 12.1% cited this reason, making it the third-most common answer among the group. At 55 million, Latinos made up 17.4% of the nation’s population in 2014 (Krogstad and Lopez, 2015), 11.4% of eligible voters and just 7.3% of voters. Yet, despite weak growth in the number of Latino voters between 2010 and 2014, their share of all U.S. voters was up from 6.9% in 2010. 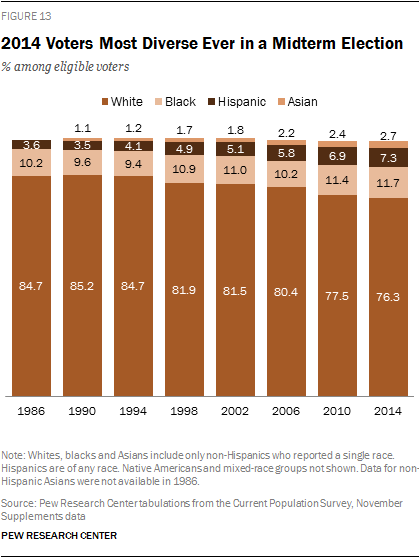 This reflects a broader trend of growing diversity among the nation’s voters (File, 2015) that has been underway since the 1980s (Lopez and Taylor, 2009). The share of U.S. eligible voters who are white has declined steadily since 1986, when 82% of the electorate was white. By 2014, 69.9% of eligible voters were white. Hispanics have driven about half (53%) of this change. In 1986, 5% of eligible voters were Hispanics, compared with 11.4% in 2014. At the same time, the share of blacks among U.S. eligible voters increased from 11% to 12.1% during this time. Among Asians, the share increased from 1.4% in 1990 to 4.2% in 2014. In 2014, Latinos supported Democratic candidates over Republican candidates in congressional races 62% to 36% (Krogstad and Lopez, 2014b). The Census Bureau’s biannual Current Population Survey November Voting and Registration Supplement is the best survey of voting behavior available because of its large sample size and its high response rates. It is also one of the few data sources that provides a comprehensive demographic and statistical portrait of U.S. voters (official voting records often do not contain voters’ full demographic details). But estimates based on the CPS November Supplement often differ from official voting statistics based on administrative voting records (Lopez and Taylor, 2009). This difference may come from the way the CPS estimates voter turnout—through self-reports (which may overstate participation) and a method that treats non-responses from survey respondents as an indication that the survey respondent did not vote (which may or may not be true). To address over-reporting and non-response in the CPS, Hur and Achen (2013) propose an alternative weight (one that reflects actual state vote counts) to that provided by the Census Bureau. As a result, voter turnout rates reported by the Census Bureau (and shown in this report) are often higher than estimates based on this alternative weighting approach. For example, tabulations using this adjustment and reported by Michael McDonald of the University of Florida (http://www.electproject.org/home/voter-turnout/demographics) produce a Hispanic national voter turnout rate of 21.1% for 2014, nearly 6 percentage points below the Census Bureau’s official estimate of 27%. For non-Hispanic whites, the adjusted voter turnout rate is 40.8% in 2014, 5 percentage points lower than that reported by the Census Bureau. Similar differences are seen among non-Hispanic blacks (36.4% versus 40.6%). No matter the method used, voter turnout rates in 2014 were among the lowest measured using the November Voting and Registration Supplement. Under both measures, voter turnout in 2014 for Hispanics dropped to a record low.